If this was already disabled for battery saving purposes or whatever other reason, you should have nothing to worry about, if not, then this should prevent Carrier IQ from sending any data over to Apple. For some background here, Carrier IQ is network diagnostic software that some cellular carriers have been installing on smartphones and tablets. Going beyond just gathering network diagnostics, Carrier IQ was found on some Android phones to be gathering personal and private information, including phone call logs, text message content, and even encrypted web searches, or, put simply, it’s a substantial invasion of personal privacy. Later, renowned iOS hacker chpwn found references to Carrier IQ in some versions of iOS, but it isn’t nearly as nefarious as what was discovered on Android, doesn’t track nearly as much personal information, and thankfully, it’s much easier to disable. 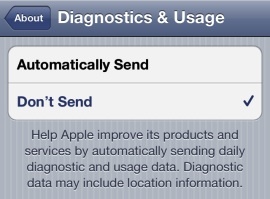 We should expect an update to iOS in the near future to address this on any remaining devices.